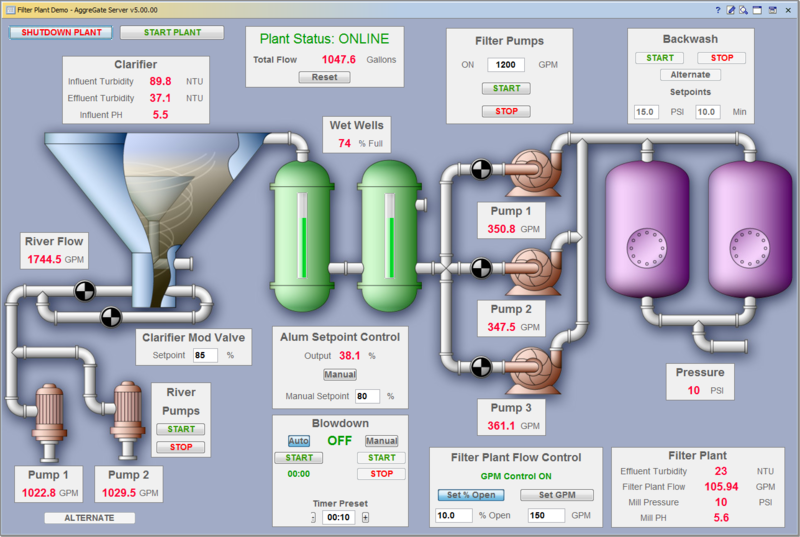 AggreGate SCADA/HMI is a system for visualizing and operating processes, production flows, machines and plants. It is a highly reliable multi-user distributed solution that provides supervisory control and monitoring for many sectors, such as Process Control, Industrial Automation, Building Automation, Telemetry, Remote Control and Monitoring, Test and Measurement, and Machine-To-Machine Communications (M2M). AggreGate SCADA/HMI has advanced data acquisition and processing capabilities inherited from AggreGate Device Management Platform, such as real-time charting, comprehensive alerting/reporting, and batch operations. It is bundled with a rich set of device drivers for accessing and controlling different PLCs, sensors and other industrial devices. Most industry-standard protocols, such as OLE for Process Control (OPC), Modbus (TCP, UDP, Serial RTU/ASCII/BIN), BACnet IP, and SNMP, are supported directly. Integrated GUI Builder application simplifies the process of creating Human-Machine Interfaces for visualizing the processes. Available user interface components include standard form elements (e.g. text fields and buttons), tables, raster and vector images, highly customizable gauges, charts, splittable/tabbed/multi-layer panels, and many more. HMI applications created in GUI Builder can be launched separately, e.g. in touch panels. The most essential features of AggreGate SCADA/HMI include support for a wide range of industrial control protocols, distributed architecture with free unlimited client licenses, failover clustering for high availability, advanced event processing and logging, visual HMI editor with intuitive data bindings, remote editing of HMIs and report templates, multi-type trending and support for dynamic charts. Each installation bundle includes fully functional free license (up to 3 devices). This site does not contain serial number, crack, keygen AggreGate SCADA/HMI serial number : serial number is the simplest type of crack. A serial number(cdkey,product key,etc) is register the program as you may already know. a crack or keygen may contain harmful software. If you cannot find the exact version you want, just give it a try. for more information read .nfo/.txt/.diz file include in zipped file.